In a series of articles, we have previously detailed the progress of gold mining deforestation in the southern Peruvian Amazon (mainly in the Madre de Dios region). 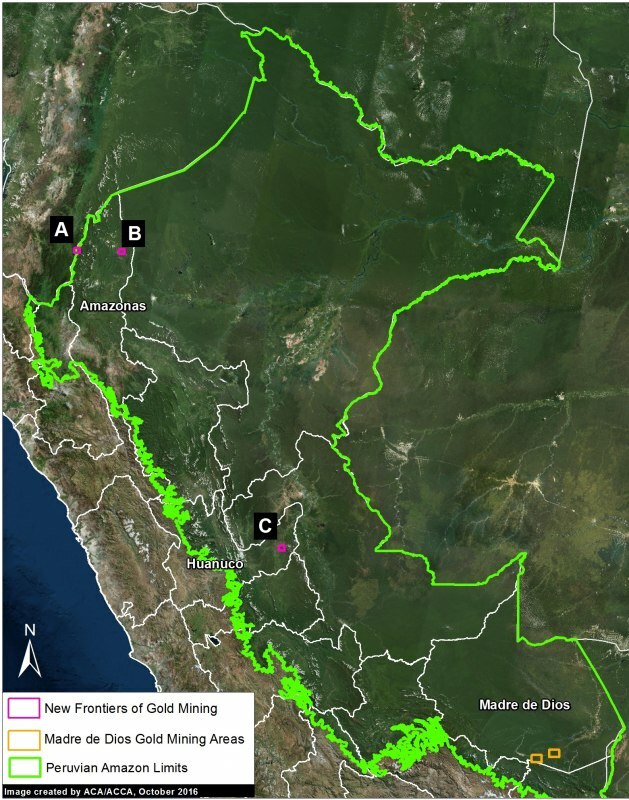 In the current report, we show the new gold mining frontiers in northern and central Peru (Image above): two cases in the region of Amazonas and a case in the buffer zone of El Sira Communal Reserve, in the Huanuco region. Deforestation in these cases is still in its early stages, so there is still time to avoid larger-scale damage, as in the case of Madre de Dios. In the Amazonas region, there are two cases of recently active gold mining deforestation: the Afrodita project in the Cóndor mountain range (Inset A) and along the Santiago River (Inset B) (Image 49b). The remote Condor Mountain Range, located along the Peru-Ecuador border, is home to rich biodiversity and territories of the Awajún and Wampís indigenous peoples. The mining concession Afrodita, on the Peruvian side, has been controversial due to the potential environmental and social impacts of mining activity in a sensitive environment. Image 49c shows the beginning of deforestation within the Afrodita concession, between December 2015 (left panel) and July 2016 (right panel). Thus far, deforestation within the concession is 12 hectares (30 acres), including the access road from Ecuador. Image 49c. Data: Planet. Click to enlarge. In the previous MAAP #36, we showed the first evidence of gold mining deforestation along the Santiago River. Image 49d shows a comparison between the situation last shown by MAAP in March 2016 (left panel), and its current state in October 2016 (right panel). To date, this deforestation has reached 10 hectares (25 acres). Importantly, in September, the Peruvian Navy intervened in the area (known as the Pastazio tributary), destroying some dredges and other equipment. Image 49d. Data: Planet. Click to enlarge. In the previous MAAP #45, we showed illegal gold mining within the El Sira Communal Reserve. Here, we highlight a new active gold mining area in the buffer zone of the reserve (Image 49e). Image 49f shows the appearance of a new mining area between August 2015 (left panel) and August 2016 (right panel). To date, the mining deforestation at this site has reached 10 hectares (25 acres). Image 49f. Data: Digital Globe (Nextview). Click to enlarge.